We recently stopped by the Ludlow Chamber of Commerce to get some information about area hiking trails and events that might peak our interest. Being that it was a warm, sunny day we asked the woman at the counter if there were any local quarries or swimming holes that would be worth visiting. 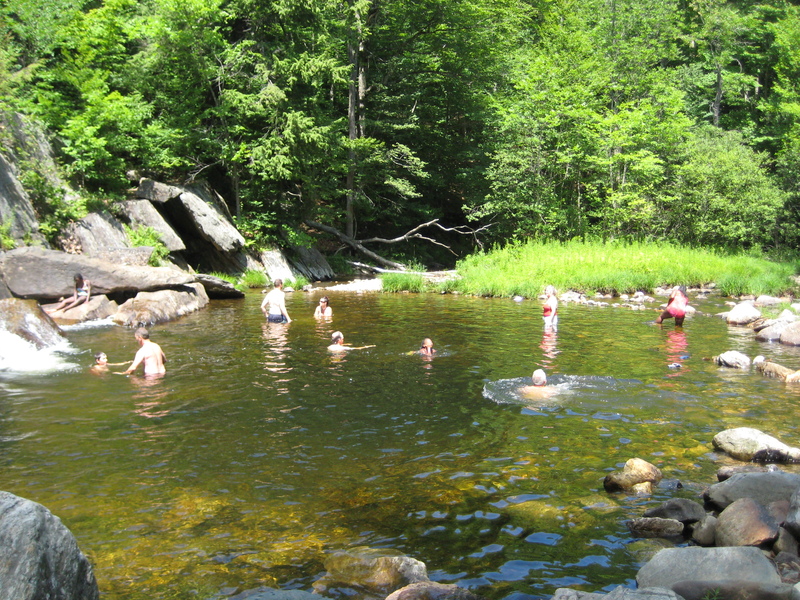 She told us about a swimming hole called Buttermilk Falls which happened to be just down the road from downtown Ludlow. We drove down to check it out and to Ashley’s surprise it was one of the spots that she and her family had come to when she was a little girl. It definitely was a swim that I wanted to take. 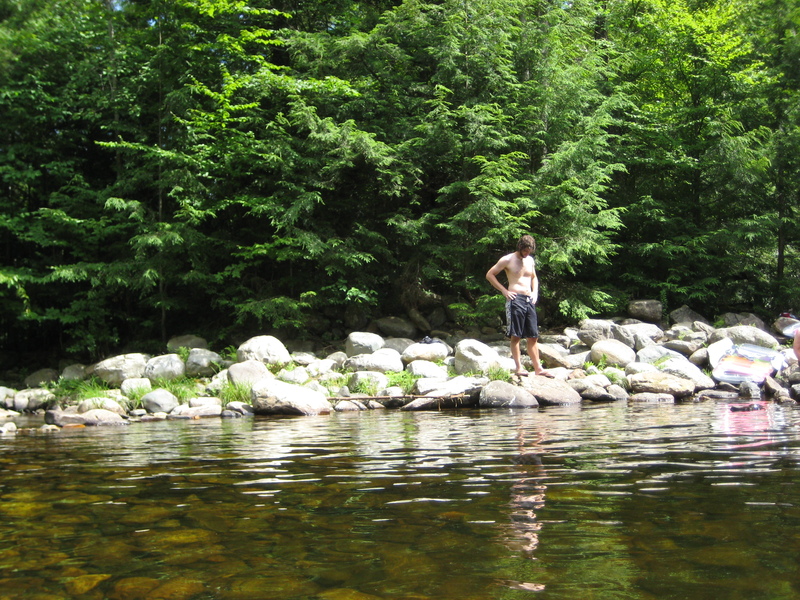 It was a particularly warm week in Vermont, so a few days later we decided to pack up a lunch and head to the Falls. We arrived just before noon and there were only a few other people there. I can’t recall the last time that I actually took a swim in a spring-fed pool, and this looked truly inviting. It was a good-sized swimming area and near the center of the pool the depth reached about eight feet. 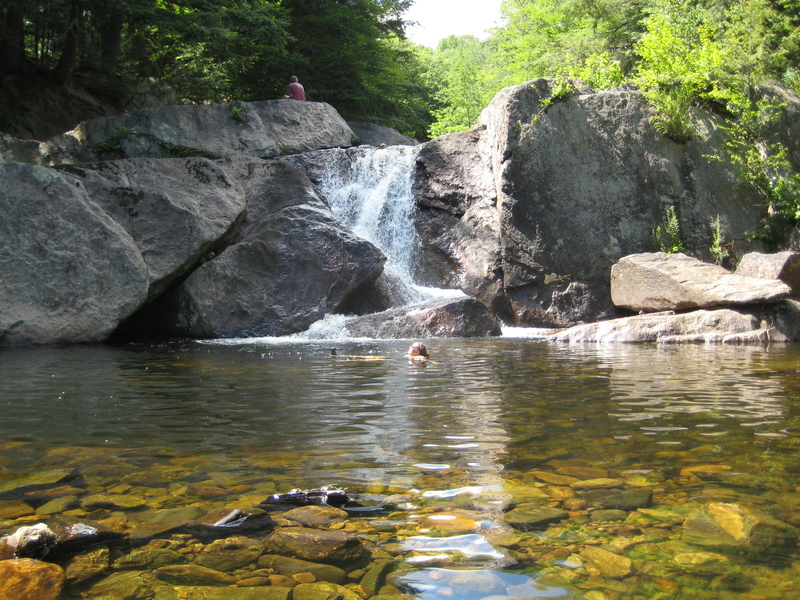 The nicest part about it was that the falls dropped directly into this swimming area. Picturesque. The water was a bit chilly, but the sun was beaming and after five minutes of dipping my toes in the water I took the full plunge. The only word I can use to describe how it felt was refreshing. Living in New York City for the past ten years I’d only swum a handful of times and this immediately reminded me of how relaxing it can be. I felt as if I were being cleansed from the stress of a decade in New York. Ashley and I swam for a couple of hours and had lunch on the rocks with only a handful of people coming and going. It was a perfect day and we will definitely be returning to this sweet spot very soon. ← The Time We Attempted To Eat Locally In Shanghai. Ah, yes, I remember when we discovered that lovely area. Summer 1994, I think, when the old workshop on our property was being renovated and turned into The Cottage. Tanner and Morgan had friends with them, and the boys kept jumping off those cliffs into the deep part. A mother’s heart-attack scenario, but it was a great place to go. Maybe when I get there later this month, we can visit it together! It all looks heavenly! We took a hike in RMNP last week that was equally inviting, but way too cold to jump into. manner of writing? I have a presentation next week, and I am at the look for such info. of just one seller. You will get solution @ http://www.piriform.com. that seems like a super-deluxe measured iPhone. În mod ideal, această declarație va fi de ajutor .